I am proud to partner with Anthem, Inc. and its affiliated Medicare health plans who provided information for this post. All opinions are 100% my own. These last couple of years have been a whirlwind. I celebrated a milestone birthday, both of my kids got married within months of each other and my husband and I have been embracing our lives as empty nesters. 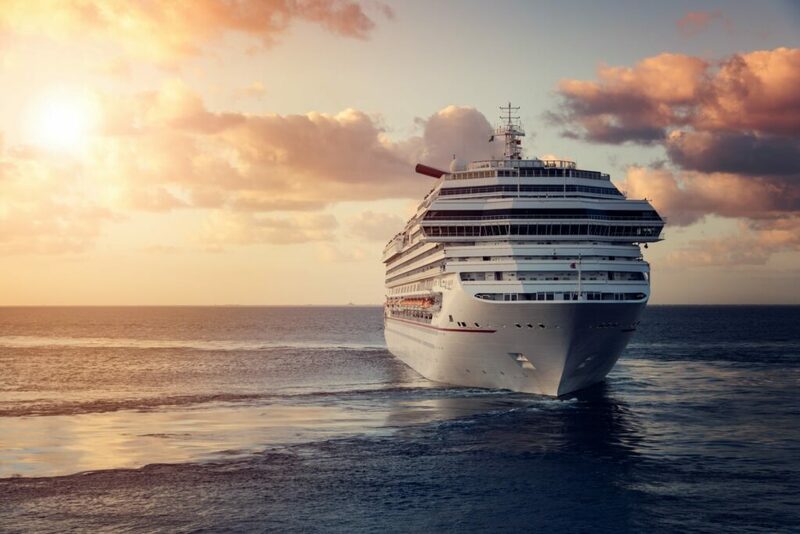 We’ve scheduled our first adventure and will be heading off on an Alaskan cruise next month. I’m so excited, I can’t wait. My husband and I look forward to planning many adventures but know that we can’t just focus on fun. We have to prepare for all aspects of our future including medical coverage. I currently have health insurance but in a few short years, I’ll be eligible for Medicare so I need to start researching which options will be best for me and my situation. The initial Medicare enrollment period actually begins 3 months prior to the month you turn 65, so make sure to mark your calendar accordingly. If you’re a procrastinator, don’t worry — you have about a total 7-month window. The initial enrollment period also includes your birth month and the 3 months after your birth month. But, don’t wait to sign up or you could have fewer choices for coverage and more expensive coverage costs. If you’re unfamiliar with Medicare, it is a national health insurance program that was started in 1966 by the Social Security Administration but is now ran by the Centers for Medicaid and Medicare Services of the United States Government. It provides health insurance to people 65 and over, individuals under 65 with certain disabilities and anyone experiencing kidney failure that requires dialysis or transplant. Medicare consists of four parts: A & B which are Original Medicare, C which is Advantage Medicare, and D which is Drug Coverage. Part A covers emergency care and hospital related services. Part B is similar to regular health insurance where you can pick participating doctors and you will have deductibles, copays, and a monthly premium cost. Part C is Medicare Advantage plans offered by private insurance companies, and take place of Original Medicare coverage. It bundles Parts A & B and many times Part D, however you’ll still be required to pay the Part B premium. Your prescription drugs are covered by Part D which is optional. You also have a choice of Medicare Supplement plans offered by private insurers if you decide to stay on Original Medicare. Medicare Supplement – or Medigap – offers coverage for additional hospital bills and other medical expenses not covered under Parts A & B. Parts A & B cost the same and provide the same coverage nationwide whereas Parts C & D vary by state and sometimes even by county. Now I’m not saying you should move to save on health coverage expenses but if a planned move is in your future just be aware that it could affect how much you pay for Parts C and D only. You only have to sign up for Medicare once but you will want to review your health and prescriptions coverage every year and make changes if necessary. The annual open enrollment period, during which time you can add or make changes to your Medicare Advantage and/or Part D prescription coverage and, runs from October 15th to Dec 7th and the changes will take effect on January 1st of the following year. You are going to want to do your research to find the best combination of coverage that fits your needs and budget. Make sure to take all factors into consideration like monthly premium costs, coinsurance costs, deductibles, and copays. 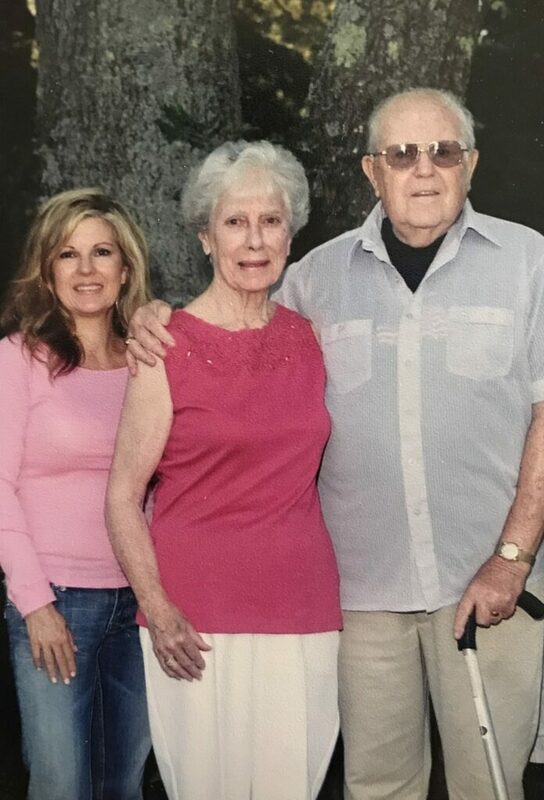 My mom, who will be 90 later this month, initially only enrolled in Medicare Part A and stayed with the health insurance provided by my dad’s former employer. A few years ago, my dad’s former employer decided to switch insurance plans so we decided to start looking at all our options for my mom. Since my mom didn’t enroll in Medicare Part B during her initial enrollment period (in 1993) she was subject to a penalty fee but enrolling her in Medicare Part B was still the best cost-effective option. We also had her enroll in a supplemental plan and prescription drug coverage and her total expenses were still cheaper than what she was paying previously. She was able to continue seeing her current doctors since they all participate in the Medicare Program. We were kicking ourselves for not looking into these options sooner. Moral of the story: Don’t wait. Do your research and prepare yourself for enrolling in Medicare. Consider it a 65th birthday present that you give yourself. 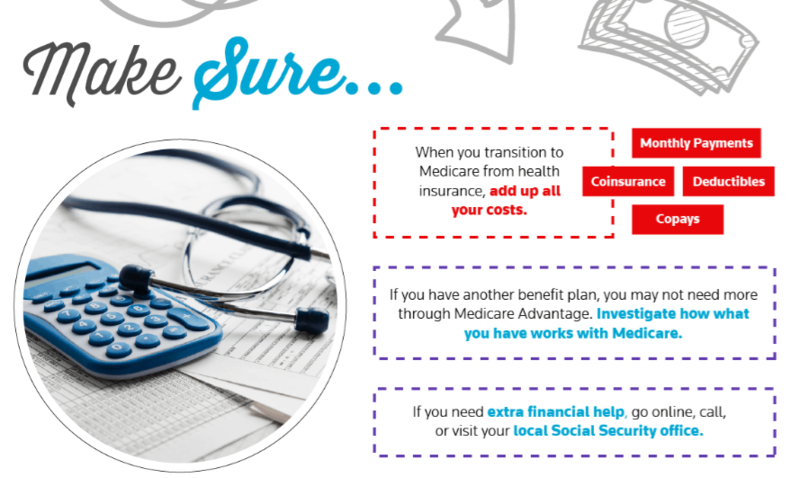 Find more information about making the move from health insurance to Medicare at Anthem.com and learn more about Medicare at Medicare.gov. Your local Social Security Office may be able to provide financial assistance for those who need it. Follow along on social media using #anthemmedicare. 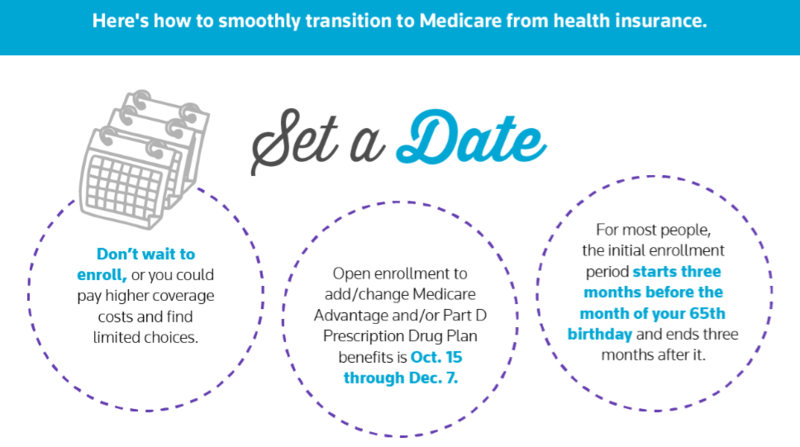 Are you making the move from health insurance to Medicare this year?